Through books and screens most people have a good idea of what New York City looks like. In 1883 it was all very different. The images here — on this page and others — should help make that clear. 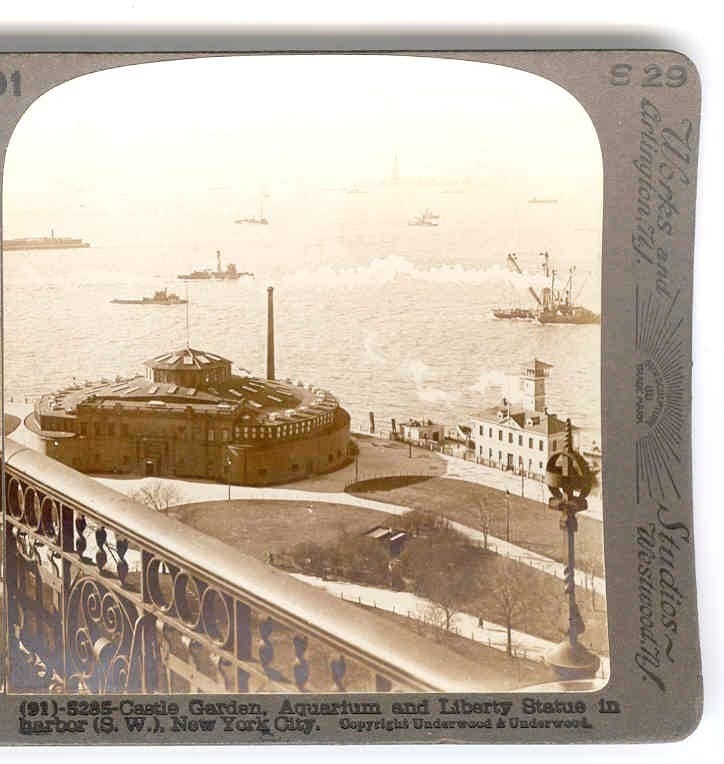 It’s hard to image the approach to the city without the Statue of Liberty, but it wasn’t there in 1883. The statue existed but the pedestal had yet to be built, so the head was put on display in Paris, while the right arm sat in the middle of Madison Square park.1 In the meantime, funds had to be raised to install the statue. In fact, for a few years anyone could pay fifty cents — a great deal of money at the time — to climb up and stand on the balcony of the torch. In the iconic time-travel novel Time and Again (Jack Finney, 1970) two characters on the run from corrupt police hide out in the arm overnight. It may be even harder to imagine, but in 1883 immigrants came through Castle Garden in Battery Park, as Ellis Island did not yet exist. My paternal grandparents were among the Italian immigrants who were brought from their ship to the Castle Garden by lighter2, where they were processed. In the city itself very little would be recognizable to us today. 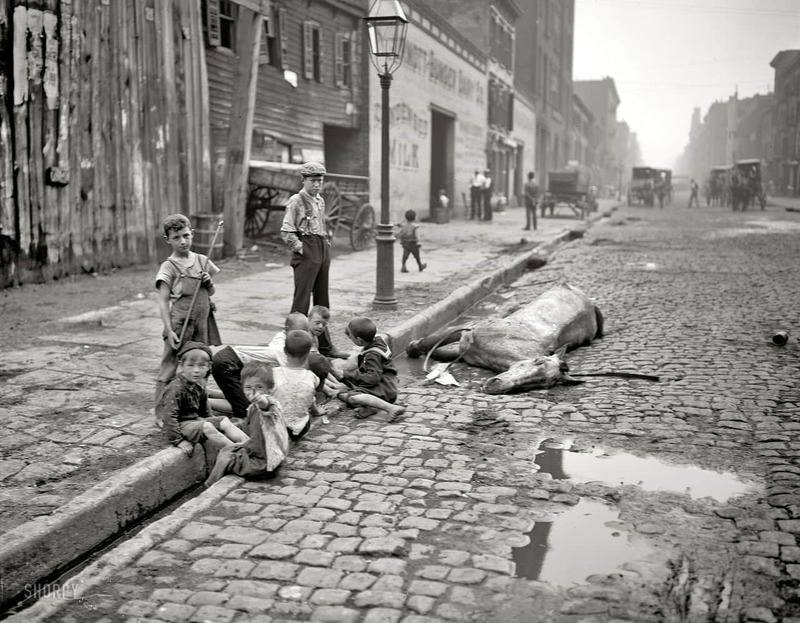 People think of New York as a not-very-clean place, but things were much worse in the nineteenth century. The biggest problems were manure and trash. In front or behind every residence were ash barrels that had to be emptied day by day. Rag pickers collected every bit of cloth; the poorest went through the gutters to collect cigar stubs, bones, and anything else that could be turned into pennies, or eaten. Indoor plumbing was unknown in many neighborhoods. In the poorest areas sanitation was a luxury, and the privies were not just repellent, they were the source of systemic infections and epidemics. Alfred Stieglitz photograph. 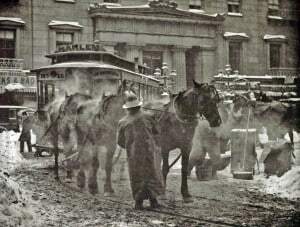 Horse-drawn omnibus. In 1883 anything that moved — with the exception of steam driven mechanical wonders — was powered by horses, including omnibuses and trolleys. The introduction of elevated trains made it possible for the city to expand northwards but the el also turned the avenues into dark caverns, showered pedestrians with ash and cinders, and compounded already significant noise pollution. With the invention of steam-powered elevators, buildings began to grow taller, and quickly. The only way to get off the island of Manhattan was to travel far north, or to get on a ferry or boat. The rivers were crowded with anything that would float, including steamboats that were prone to fires and explosions. The Brooklyn Bridge (fifteen years in the building) opened in May of 1883, but the Williamsburg, Manhattan and George Washington bridges were twenty years and more down the road. No Holland tunnel, no Lincoln tunnel, no tunnels at all. They had all yet to be dug. In 1883 there was no Times Square (the space was there, of course, but it was called Longacre Square and it looked nothing like the current day version; there were no Flatiron Building, Empire State or Chrysler Buildings, no lions in front of the New York Public Library. In fact, no library. 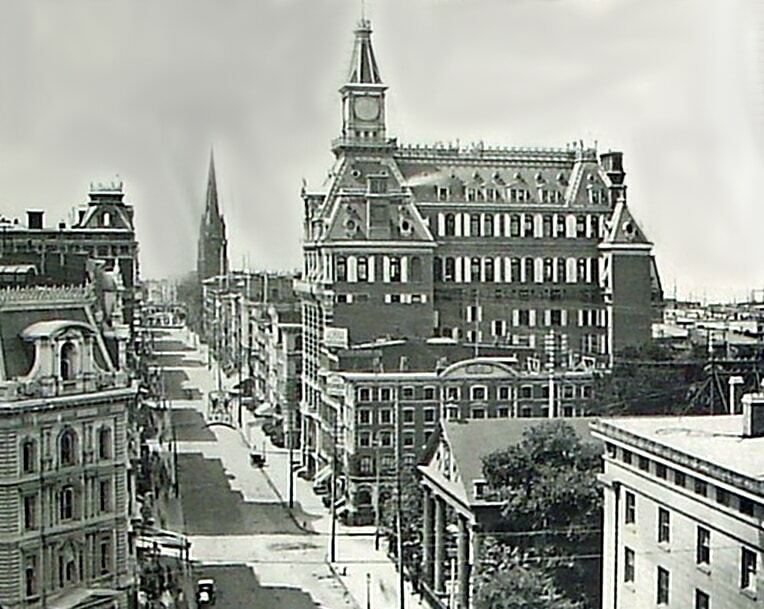 Bryant Park and the Croton Water Reservoir stood where the library is today. But the city was very busy. Union Square and Madison Square were crowded with shoppers and visitors; huge department stores lumbered uptown along Fifth Avenue, and then congregated along Sixth Avenue to become what was called the Ladies’ Mile. There were dozens of concerts, plays, lectures, debates, religious festivals for all populations, pocketbooks and ethnicities. Cafes and restaurants were easily to find — oyster houses were especially popular — as were saloons, taverns, gambling halls, opium dens, and brothels, some draped in velvet and silk, and others with dirt floors and wooden bunks. Newsboys and the homeless hung out in cellar rooms where they paid pennies to drink the dregs out of ale barrels. In 1879 the New York city government hired the Brush Electric Light Company to build a generating station at 25th Street. 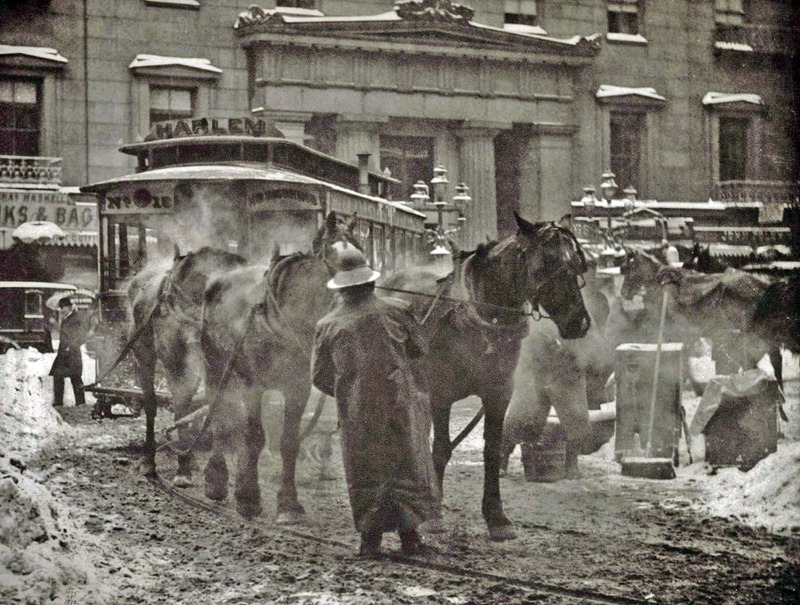 Electric street lights installed on Broadway between Union Square and Madison Square were first turned on on December 20, 1880. 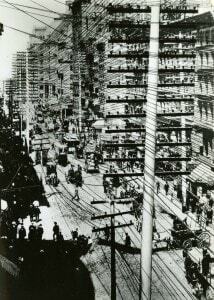 In September 1882 Edison opened the first power station on Pearl Street. 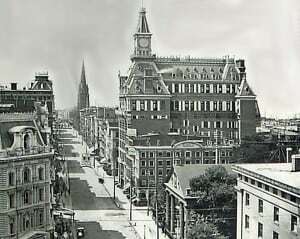 Washington Square Park was wired for electric lights in this same period. It would take some time for electricity to become available in the whole city. The poorest neighborhoods were, not surprisingly, the last to be electrified. By 1883 the telegraph was well established (the police department, for example, adopted the system very early on), but it was too expensive to be used for everyday communication. 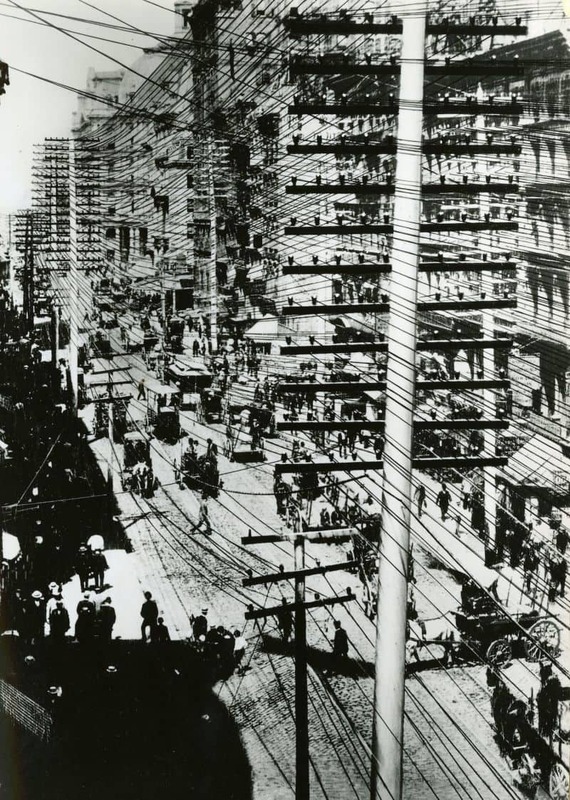 With the telegraph came a spiderweb of overhead cables that held the whole city down. 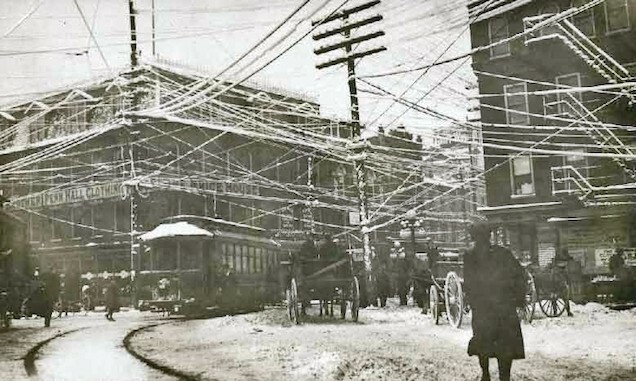 Within a few years this was made worse by the wires that came with the spread of the telephone and the growing electrical grid. The postal service was at its height; there were two and sometimes more deliveries a day in some neighborhoods. Newspapers and magazines were printed in English, German, Yiddish, French, Italian, Chinese and a half dozen other languages, not surprising in a city a composed primarily of recent immigrants. It’s estimated that some thirty thousand abandoned or orphaned children lived on the streets in utter poverty. The death rates for children under one were shocking: By 1870 there were more than 200 deaths in a 1,000 for children under one. One in five of those children who survived their first year would die before they turned five years old. 5 The malnutrition, exposure, poor sanitation and miserable living conditions that followed from poverty made for very short lives. 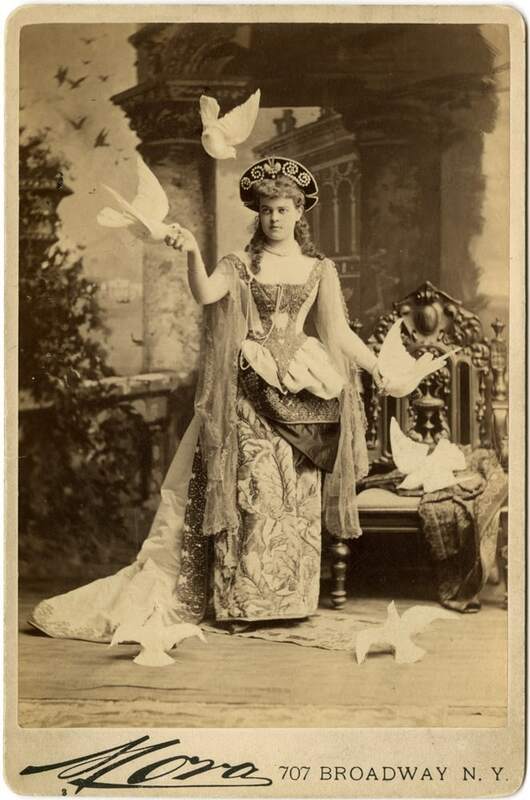 Alva Vanderbilt in all her bejeweled costume glory. 1883. Not everyone was blind to the conditions, or content to leave things as they stood. Jacob Riis, born in Denmark in 1849, immigrated to the U.S. and became one of the first photographers to establish candid photography as a way to document social ills. The photo above of the homeless child sleeping on a public stair is one of the many he took. Riis was proud to be called a muckraker — an investigative journalist dedicated to exposing social inequalities and the political corruption which allowed such conditions to continue. Another person who made real contributions was Peter Cooper, who established the Cooper Union, a free school open to anyone, where engineering, the sciences and the technical arts were taught. If you were female you could not vote or enroll in the established colleges (and if you were African American, male or female, the chances of advanced education were far worse); if you were Irish or German or Italian and had no established relatives or money when you arrived, you’d find it pretty hard to get a job anywhere but as a domestic or laborer. The second half of the nineteenth century saw great leaps forward in medical science, primarily because of the work done by Pasteur and Lister and their colleagues in advancing the study of bacteriology and the importance of sanitation|sterile technique. Poor people died of preventable diseases, but everyone died of conditions that cause little problem today. Surgery was not advanced enough to deal easily with anything more complex than hernias or gall bladders, but medical science was advancing quickly. Women were making inroads into medicine despite resistance from their male counterparts. There are dozens of websites and weblogs dedicated to exploring the history of New York city. Please see the links page for a full list.